The pieces are in place. After many months of clandestine organisation, Vercingetorix, backed by the druids and leading an army of rebellious tribes, is ready to make his first moves towards independence for his people and the annihilation of Rome’s presence in Gaul. Meanwhile, Caesar tends to business in Aquileia, unaware that he is cut off from the bulk of his army in the north by the rebellion. 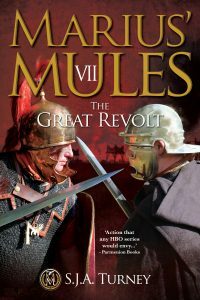 A desperate message brought to Fronto at Massilia spurs the forces of Rome into movement and Caesar is compelled to act in cunning and unexpected ways in order to recover the initiative. Fronto and his friends are heading for a clash of armies the likes of which the north has never seen, and the Tenth’s legate is about to face his most trying year yet facing his opposite number – a chieftain of the Arverni – across the fields and hills of Gaul towards the greatest siege he’s ever experienced: Alesia.